October 11, 2017 September 20, 2017 / Julie Brook, Esq. So you’ve gathered the client’s data—personal and financial—and know the client’s objectives. What do you do? Here are 5 typical documents you’ll need for the estate plan. Will. A client who needs an estate plan almost always should have a will. Even if the primary estate plan is contained in a revocable trust document, there should also be a short pourover will that transfers any probate assets to the trust after the client’s death. A formal will generally is typed or printed and must be signed by the testator and by at least two witnesses. See Prob C §6110. By contrast, a holographic will is written entirely in the testator’s own handwriting and signed by the testator, and it doesn’t need to be witnessed. See Prob C §6111. 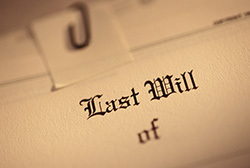 Neither type of will has to be dated, but a will always should be dated to determine which of several instruments is the decedent’s last will. Revocable Trust. A revocable trust is a common estate planning document in California. The client typically retains direct control over the trust property by acting as the trustee until the client’s death or incapacity, and trust assets are fully available to and managed by the client during the client’s lifetime. A single client generally will have one revocable trust that holds title to substantially all of the client’s assets, and married clients generally should have a joint property trust that holds title to substantially all of their community property and separate property trusts that hold substantially all of their respective separate property and which will receive their one-half interests in their community property after the first one of them dies. Often, the trust document will provide that assets held in joint tenancy are really community property. This provision will result in a new income tax basis for both halves of the community property on the death of either spouse, whereas joint tenancy assets generally receive a new basis only for the decedent’s one-half share. IRC §1014. Beneficiary Designations for Retirement Plans, Life Insurance Policies, and POD Accounts. A comprehensive estate plan will ensure that retirement benefits, life insurance proceeds, and assets in pay-on-death (POD) accounts are disposed of in a way that’s consistent with the objectives of the client’s overall estate plan. This may result in consolidating the benefits and proceeds, after death, within the then irrevocable or “administrative” trust or various subtrusts. If so, the beneficiary designations for the policy proceeds and assets in the retirement plan or POD account must be changed to name the appropriate trust as the primary or contingent beneficiary. Beware of spousal consent requirements. Durable Power of Attorney for Financial Management and Personal Care Decisions. A durable power of attorney for financial management typically authorizes the agent to engage in all types of arm’s-length transactions with respect to the principal’s property. An agent may even be given the power to make gifts to certain individuals and charitable organizations. If the principal has established a revocable living trust, the agent generally should be authorized to transfer the principal’s property to the trust, after which the property would be managed by the trustee under the terms of the trust document. If the principal hasn’t established a revocable trust, the agent may be authorized to establish one, in which case the property transferred to the trust during the principal’s lifetime typically is distributed to the beneficiaries of the principal’s probate estate after the principle’s death, but without subjecting the trust property to probate administration. Advance Health Care Directive. An advance health care directive, among other things, allows an individual to direct his or her physician to withhold or withdraw life-sustaining medical treatment in the event of terminal illness or permanent unconsciousness, or if the risks and burdens of treatment would outweigh the expected benefits. The individual also may direct to only receive treatment necessary to provide comfort and to relieve pain. See Prob C §4701. An advance health care directive or power of attorney for health care also authorizes an agent to make health care decisions for the principal if he or she is unable to make decisions even when life-sustaining treatment is not an issue. 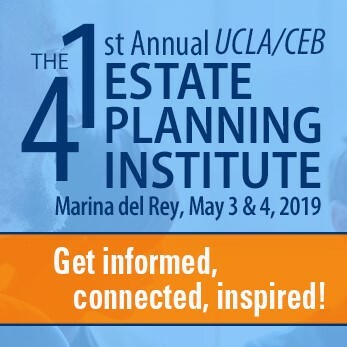 Get step-by-step guidance on developing an estate plan and putting it into place in CEB’s California Estate Planning, chap 1. Learn how to draft a will and a trust document in CEB’s California Will Drafting and Drafting California Revocable Trusts, respectively. Also check out CEB’s California Powers of Attorney and Health Care Directives. Fresh to the estate planning field? CEB’s new online course Practice Skills │ Estate Planning will give you the detailed guidance and instruction you need to begin practicing as an estate planner. ← Is Banning Solar Allowed?